First, I love love love the gouache. Best “mistake” I ever made (in art!). Second, yes, there is a crease in the middle of the painting. “Doughnut Painting, First Try” is under this painting. And when I messed it up, I washed as much paint off the paper as I could. Then I folded it and threw it away. I did not do any of that in a calm manner, because painting does not make me calm. It makes me a maniac. I was a raging maniac. I’m keeping this painting even though it has a crease. It reminds me to pause before I throw away a painting. It reminds me to keep trying. And, well, I like pink frosting. 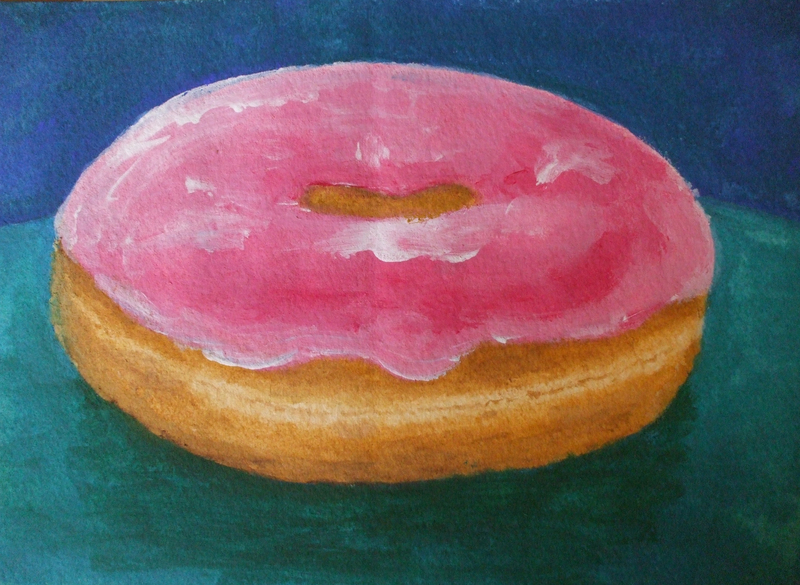 This entry was posted in art works, Business as usual and tagged donut, doughnut, gouache, painting. Bookmark the permalink. I love it! I’d hang it right in my kitchen…somewhere near my kitchen table. It’s joyful!